Help us build a bright future for Preparatory Music! 50 years of nurturing young musicians, and counting! Preparatory Music is one of the first Suzuki centers on the West Coast, and has remained a recognized institution for both Traditional and Suzuki music instruction. We seek to develop the musical potentialin young people by creating a nurturing environment where students, teachers and parents together foster a life-long appreciation of music. 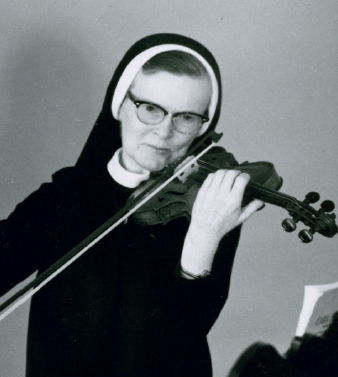 To ensure another 50 years and more, please join us in creating our Sister Therese-Cecile Murphy Endowment Fund. Whether you have been part of our musical family, attended one of our performances, or you simply want to keep our unique arts education program available for generations of children to come, please consider participating. Too many Bay Area families cannot afford the cost of music lessons. We typically have 2% of students receiving some level of financial aid; our goal is to grow that number to 20%. We are committed to making music accessible for all young people, regardless of socio-economic challenges their families may face. Our community could take advantage of new program offerings, education and lecture series, facility improvements, and equipment updates/maintenance. Our goal is to make the Prep Music experience as vibrant and fulfilling as possible—for students, families and teachers alike. An endowment would provide our program greater financial independence from economic, governmental and political forces. This fund will help ensure our presence and continued growth as an exemplary center for music education in Oakland and the greater East Bay. We need to raise $25,000 to launch our endowment fund. We invite you to become part of the Preparatory Music legacy TODAY—and in perpetuity. Together, let’s build a stronger foundation to continue offering the very best in music education to our young people. Please donate to the Endowment Fund in hono of a teacher, a loved one, or your child. We deeply appreciate any level of support you can give (and don’t forget corporate matching funds!). All donations are tax deductible.